Do you feel overwhelmed with social media? Maybe you’re getting a lot of engagement on one of your channels, but how can you use it to specifically grow your blog? Hi, I’m Jessica Bowman, and I am the social media manager and Director of Growth for Ruth Soukup Omnimedia, which includes Elite Blog Academy, Living Well Spending Less, and Do It Scared. But once upon a time, I was a blogger and EBA student, just like you! And so I totally feel your pain…social media can feel like this totally overwhelming, daunting time waster! With just a little know-how, you too can use social media to grow your blog traffic and find out exactly what your audience wants–and how to give it to them. These 8 strategies will help you stop spinning your wheels with social media and start using it like a pro! While you may be familiar with checking Google Analytics to see how many visitors you’ve had on your site, are you also using it to see where that traffic is going, and where they’re coming from? This post will help you to better understand and use Google Analytics for this purpose, if you’re feeling stuck or needing help! The main places you want to focus in Google Analytics are: what are your most popular posts over a certain date range (a good starting place is 12 months), and what social networks or searches brought readers to those posts? Once you’ve figured out which posts resonate the most with your audience, it’s time to add those to your social media posting schedule! Typically, viral posts will go viral over and over as they find new audiences. Even if your post isn’t viral yet, if it’s popular with your readers once, chances are it will be again and again. Pro Tip: Don’t discount pages! If you have a page on your website that is just as popular as a post, don’t be afraid to share it on social media as well! A great example of this would be your About Page or a Start Here Page. Chances are, your readers are checking out one of these pages to learn more about you. Why not incorporate that into your social media posting strategy, so that your social media audience can get to know you, your brand, and what you’re all about! Do you have a certain post or posts that resonate more with your readers than others? Which posts do you notice get crazy engagement on social media every time you post them? Be sure to link these posts together or add related posts to your posts so that similar information is easy to find. This will keep people on your blog longer, make your blog more “sticky”, and reduce your bounce rate, all while giving your readers more of what they want! You could even use one of these posts to create a free printable that will help grow your email list as well as your blog. Use social media to poll your audience and find out what they want to know more about. Then write content speaking to those needs or frustrations. Asking these questions gives me insight into what our audience is really needing the most, and then I am able to provide specific examples and direct quotes from people to our content team. If you’re an Army of One, you can try keeping a “customer struggles doc,” and any time you get a comment of someone expressing a specific need, just paste it into the doc. Then when it comes time to brainstorm content, you already have a list of post ideas ready to go! Even this very post came to fruition because someone expressed her frustration with being overwhelmed by social media and using it to grow her blog. When you echo those frustrations back to your readers and then solve their problem, the content writes itself! Do you follow a social network for a blog that is similar to yours? What do you notice works well for them, and what do you notice does not? If a simple “Yum–this is what I’m having for dinner tonight! How about you? → (link to post)” social media post works for someone else, but you’re writing out 2-3 paragraphs of long, flowery text for each blog share, consider giving this alternative method a try. Chances are, if it worked for them, it may work for you! If it doesn’t work for you, then at least you know and can try something else that will work better. 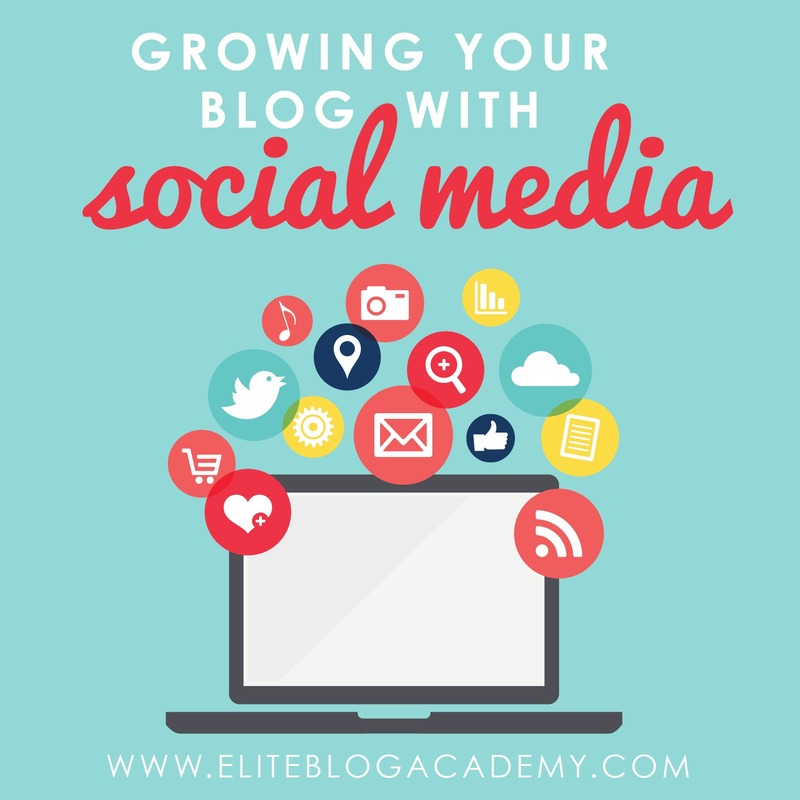 This process of constantly refining and improving your social media posts will help you grow your blog strategically and effectively! Did you write 4 holiday-related posts that did well last year? Don’t forget to share them again during the next holiday season! Many bloggers get so wrapped up in creating new content that they forget about their older-but-still-perfectly-good content. In fact, it’s often our oldest posts that get the most traffic! It might be easier and more effective to check out an older post and update graphics and links and post it as new on social media than it would be to create a whole new post from scratch. One thing I like to do is to look at Social Media Insights to see which posts were most popular during a certain month. For example, on Living Well Spending Less, in December, budgeting posts perform horribly, but in January, they’re almost always viral! Soup recipes that do well in winter months do not do well in summer months. Think about which of your posts work for certain months, and then add them to your posting schedule. This will bring more traffic to your blog because you’re giving your audience what they want precisely when they want it! Do you already have an answer to a reader’s question? Give it to them! Remember earlier when I said that you should regularly poll your audience to find out where their struggles are, and then create content speaking to those needs? Well, what if you’ve already created that post? If you’ve already written a post speaking to someone’s frustrations, be sure to share it with them! For example, when I ask people on Living Well Spending Less what is their biggest frustration in organization, it never fails that I will get a TON of answers about paper clutter! Since we have already written a very comprehensive post about taming paper clutter, I will often reply to comments on social media linking to that specific blog post, because I know it will help them right away! Then, I often share that as its own post soon after because I know it’s something that our audience is thinking about in that moment. There’s a certain social media course that has been recommended to me over and over again, and people are constantly singing its praises! I had tried it once a couple of years ago and decided the strategy wasn’t the right fit for our brands and audiences, but after a little more persuading, I decided to give it another try recently. I had been following the assignments for only a couple of days when the Boss Lady herself, Ruth, saw my experiments and decided she needed to step in and take over my department! I saw it as an experiment, an opportunity to try different methods and to see what kind of results we could get. She saw it as a hodge podge mess! Sure, we were getting lots of engagement, but ultimately, we were confusing our audience by sending them to outside blogs and websites. Of course, the Boss Lady was right! I should have trusted my own instincts and experience with managing our networks for over two and a half years, but I fell victim to “Shiny Penny Syndrome”, as I’m sure you have probably experienced at some point too! The point is, I should have followed my own advice and stuck to my methods of constantly fine-tuning and improving our posts every week and month. You don’t have to radically change your strategies to fit what other people are doing. The best way to grow your blog with social media is to just pay attention to what is working, what days and times do those posts work best, what types of posts are they (are the photo posts, links, videos, or status updates? ), and just continue to tweak your posting schedule as you learn more about what works and what doesn’t! Check out what your competitors are doing and experiment, but don’t forget to stay true to your own mission and brand. What works for your audience may not work for someone else and vice versa. Did I leave anything out? Where do you struggle most with using social media to grow your blog? Be sure to leave a comment letting me know how I can help in a future post! This is excellent advice, and it has come at a timely moment! It’s something that’s already crossed my mind; now I have a better idea what to do about it. So does using social media mean that we need to use a hosting site as well? Comment for Debb: I’m a Senior too, and holding down another job as well as building my blog. And I can cheerfully say YAY SENIORS! Who says we have to quit living and learning at some predetermined time? Yes, I too am a little slower than I was two decades ago, but that doesn’t stop me. You go girl! Thanks for the reminder to share good, old posts. You’re right. Per analytics, the most popular, most read posts on my blog are O-B-V-I-O-U-S.